A 31-year-old Schofield Barracks soldier charged with killing a civilian contractor in Iraq last month will face the military equivalent of a preliminary hearing Dec. 8 in a Wheeler Army Airfield courtroom. Spc. Beyshee Velez — assigned to the 3rd Bronco Brigade Combat Team’s Headquarters and Headquarters Battery, 3rd Battalion, 7th Field Artillery — is accused of shooting Lucas “Trent” Vinson with an M-4 carbine. Velez, who was on his third combat deployment to Iraq, has been confined to the Ford Island brig, where he was taken shortly after the Sept. 13 shooting. He is charged with two counts of murder, one count of trying to elude Air Force security forces at Contingency Operating Base Speicher and three counts of assault. After hearing all of the testimony presented at Velez’s Article 32 hearing, the presiding officer will send his recommendation to Maj. Gen. Robert Caslen, commanding general of the 25th Infantry Division, who will determine whether a court-martial will be convened. A murder conviction by court-martial could result in life imprisonment for Velez. Vinson, 27, had been working for the Houston-based KBR since 2003 when he was killed. Vinson’s family was told by Army officials that he was shot three times after picking up a soldier who flagged down his vehicle at Contingency Operating Base Speicher near Tikrit, about 105 miles north of Baghdad. A KBR manager said the shooting occurred at 8:30 a.m. near the project manager’s house. Civilian Contractors Toll in Iraq and Afghanistan Ignored by Defense Dept. Civilian Contractor Toll in Iraq and Afghanistan Ignored by Defense Dept. 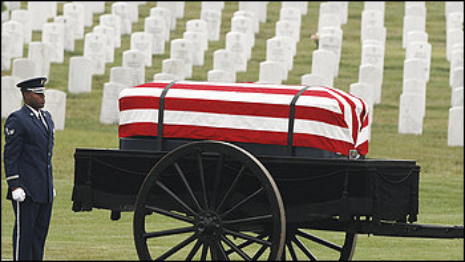 s the war in Afghanistan entered its ninth year, the Labor Department recently released new figures  for the number of civilian contract workers who have died in war zones since 9/11. Although acknowledged as incomplete, the figures show that at least 1,688 civilians have died and more than 37,000 have reported injuries while working for U.S. contractors in Iraq and Afghanistan. More than 5,200 soldiers have died in the two war zones, meaning that one civilian contractor has died for every three soldiers — a ratio that reflects the unprecedented degree to which the Pentagon has outsourced the work of war. Civilian contractors make up  about half the total U.S. forces in the war zones and they have been deployed on the front lines far more than any previous U.S. conflict . Iraq and Afghanistan are the most outsourced wars in U.S. history. Despite the importance of civilian contractors to its mission, the Defense Department hasn’t been measuring their sacrifice. A little-noticed report  from the Government Accountability Office last week noted that the Pentagon has yet to implement a Congressional requirement to track contractor fatalities. Military officials brushed off inquiries from the GAO, telling the agency that they “continue to lack a system to reliably track killed or wounded contractor personnel.” To get a handle on the issue, the GAO examined a sample of files from the Labor Department, which oversees a workers compensation program required by a federal law known as the Defense Base Act. The act requires contract firms to purchase insurance to cover civilians injured or killed while working abroad on federal contracts. While the system is not designed to track war injuries, investigators determined that about 11 percent of reported contractor casualties stem from combat — about the same percentage of soldier casualties attributed to hostile action, according to an April 2007 report  by the Veterans Affairs Department. For both groups, most injuries are due to vehicle collisions, muscle or back strains or common, everyday accidents. The Department of Defense is not alone in ignoring its hired help. Neither the State Department nor USAID could tell with certainty how many contractors they employed, the GAO found. USAID, for instance, failed to report how many civilians it had put to work under a $91 million contract to develop hydroelectric plants and small and medium businesses in Afghanistan. A State Department contracting officer insisted that there was no need to track local Iraqi hires, despite specific statutory language to the contrary, the report found. “Officials acknowledged that they are likely undercounting the actual number of contractors working in Iraq and Afghanistan,” the GAO concluded. State, USAID and DOD officials all told the GAO that they were working to fix the problem. What it all means is that nine years after the launch of the most contractor-intensive war in U.S. history, nobody is sure how many contractors there are, what they are doing, or how many have been killed or wounded. Reggie Lane was once a hulking man of 260 pounds. Friends called him “Big Dad.” Now, he weighed less than 200 pounds and his brain was severely damaged. He groaned angry, wordless cries. The nurse moved fast. Two bursts of deodorant spray under each useless arm. Then he dressed Lane and used a mechanical arm to hoist him into a wheelchair. He wheeled Big Dad down a hallway and parked the chair in a beige dining room, in front of a picture window. Outside stretched a green valley of pear trees filled with white blossoms. Lane’s head fell forward, his chin buried in his chest. His legs crossed and uncrossed involuntarily. His left index finger was rigid and pointed, as if frozen in permanent accusation. In 2004, Lane was driving a fuel truck in Iraq for a defense contractor when insurgents attacked his convoy with rocket-propelled grenades. For most of the five years since, Lane, now 60, has spent his days in silence — a reminder of the hidden costs of relying on civilian contract workers to support the U.S. war effort. His wife, Linda, said visiting her husband was difficult. They were childhood friends and fiercely loyal to each other. On this spring morning, she caressed his hand and told him she loved him. In Iraq and Afghanistan, the U.S. military has depended on contract workers more than in any previous conflict — to cook meals for troops, wash laundry, deliver supplies and protect diplomats, among other tasks. Tens of thousands of civilians have worked in the two battle zones, often facing the same dangers as U.S. troops and suffering the same kinds of injuries. Contract workers from the U.S. have been mostly men, primarily middle-aged, many of them military veterans drawn by money, patriotism or both, according to interviews and public records. They are police officers, truck drivers, firefighters, mechanics and craftsmen, mostly from rural corners of America, especially the South. Many of the civilians have come home as military veterans in all but name, sometimes with lifelong disabilities but without the support network available to returning troops. There are no veterans’ halls for civilian workers, no Gold Star Wives, no military hospitals. Politicians pay little attention to their problems, and the military has not publicized their contributions. Lane was born in Ventura and moved to Grants Pass, Ore., when he turned 12. He met Linda there, and the two grew up together. After high school, Reggie enlisted in the Army and went to Vietnam. He and Linda found each other after he returned. By then, each had been married and divorced, and each had a child. As a pair, they were inseparable. Reggie was steady, strong. Linda was energetic and outgoing. They eventually found work as a truck-driving team, steering tractor-trailers across the country. His CB radio handle was “Grizzly.” Hers was “Wild Cat.” He loved country music and Tom Clancy novels, G. Gordon Liddy’s talk show and Honda motorcycles. She loved the open road, the speed of the truck. “We went to see the big wide world driving a truck. What an adventure,” Linda recalled. But work was haphazard, and the pay was modest. Together, they made about $32,000 a year. They had a hard time keeping up with bills and twice filed for bankruptcy. In the late 1990s, they sold their home in Oregon and moved to Montana, where land was cheaper. In the fall of 2003, Linda heard that defense contractor KBR Inc. was hiring truck drivers to deliver fuel, food and supplies for the military in Iraq. The salary was $88,000 a year, more than they had ever earned. By November, Reggie was on his way to Iraq. He arrived during a turbulent period, with the insurgency raging. Convoys regularly came under attack. The trucks were not armored. On April 9, 2004, Reggie Lane and a friend, Jason Hurd, rolled out of a base south of Baghdad to deliver fuel to Balad, north of the city. The convoy was outside Baghdad when gunfire rang out. Hurd saw Reggie’s truck careen to the side of the road. Hurd pulled over. A rocket-propelled grenade had shattered the windshield. Reggie was lying face-up on the shoulder of the road. His right arm was gone below the elbow. His face was covered in shrapnel wounds. He was drenched in blood. The rest of the convoy moved ahead, apparently oblivious. Hurd fumbled with Reggie’s arm, trying to apply a tourniquet. Then a group of military vehicles pulled over to help. Soldiers helped stabilize Lane, who shuddered awake and asked for water. An Army helicopter evacuated him to a U.S. base, where he was put on an emergency flight to Germany. Linda got the news from a military doctor. A few days later, Reggie called. He told her not to worry. “I still got one arm left to hug you with,” he said. It was the last conversation she would have with her husband. Two days later, another military doctor in Germany called Linda, asking permission to perform an emergency tracheotomy on Reggie. A blood clot had dislodged, blocking the flow of blood to his brain. Ten days after the attack, Reggie Lane was on a flight back to the U.S., headed to a Houston hospital. KBR paid to have Linda meet her husband in Texas. She was unprepared for the sight. A raw, red stump was all that remained of his right arm. There was a hole in his throat. She could see his intestines, which were left exposed to aid in cleaning out shrapnel. His body was swollen and purple. He was unresponsive, his pupils mere pinpoints. Over the next nine months, Linda lived out of a hotel in downtown Houston. She became her husband’s advocate, navigating a complex medical world with little guidance. “It was a lot of one foot in front of the other. I was pretty devastated,” she said. Slowly, Lane’s condition improved. Toward the end of his hospital stay, he could respond to questions. He would say: “Love Linda.” He was trying to stand up with help. In January 2005, doctors cleared Reggie for release. He was going home. Grants Pass had a handful of nursing homes. They provided physical and speech therapy, but Linda was dissatisfied with the care. She confronted workers at one home, leading to Reggie’s discharge. He returned to a hospital. Linda was dealing with her own health problems. Her weight ballooned. She was admitted to the hospital repeatedly with breathing difficulties. As Linda searched for a home for her husband, she got into a dispute with American International Group Inc., the insurance carrier for KBR. Linda wanted her husband close to home. She said AIG insisted that he go to a facility in Portland, where care was less expensive than in the hospital. Troops injured in Iraq are guaranteed care at Veterans Administration facilities. In contrast, contract workers depend on worker’s compensation insurance paid for by the federal government under the Defense Base Act. They often must fight with insurers to get medical bills paid. Linda hired a lawyer, and AIG relented, allowing Reggie to be placed in an adult foster care home near Grants Pass. The lawyer, Roger Hawkins of Los Angeles, said it was the least Reggie deserved. AIG and KBR declined to comment on the case. Reggie’s mental state had gradually declined since he’d left Houston. Before, he spoke. Now he descended into long silences broken only by grunts. Told of Lane’s condition, Kothari, who treated him in Houston, expressed concern. Jim Gregg, operator of the foster care home where Lane was placed, said the facility was not equipped for advanced physical or speech therapy. In their home on a 4-acre farm, Gregg and his wife provided basic medical care and monitoring to half a dozen elderly patients. Gregg closed his facility earlier this year, and Lane was moved to another foster home. The total cost of Lane’s care for the rest of his life could be as much as $8.9 million, according to an AIG estimate. The bill will be paid by the federal government, which reimburses insurers for combat-related claims from war zone workers. Linda Lane died July 10. She had been hospitalized after suffering respiratory distress, family members said. Reggie let out a wail when relatives told him the news. “I had never heard anything like that before,” said Bev Glasgow, who runs Lane’s current foster home. Glasgow arranged for a van to take Reggie to a memorial service for his wife. It was held in a state park alongside the Rogue River. Under the shade of scrub oak and aspen, he watched as Linda’s family and friends sang “Amazing Grace” and looked at old photos of the couple. Diane Firestone, Reggie’s sister, visited him shortly after Linda’s death. She said the family accepted that Reggie’s condition was unlikely to change. But, she said, they did not believe his sacrifices had been adequately recognized, by his company or the country. She knelt beside her brother and asked him about the attack on his convoy.